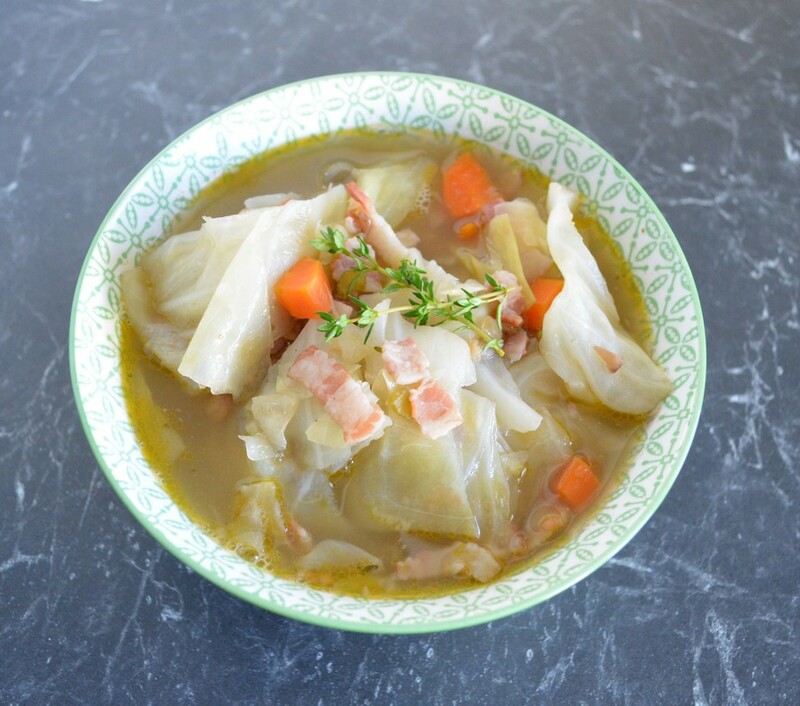 This soup came about as I had a savoy cabbage in the refrigerator that needed to be used up, and my husband had requested a soup for dinner. So off I went searching for a recipe. I found this one from Marco Pierre White, I had never cooked one of his recipes before, nor watched him cook. So I found this soup, and watched the video that went with it, I love him. He is mesmerising to watch, so suave, so cool. No gimmicks, no swearing, just amazing to watch this man cook, and soup for that matter. Now as for the soup, it was amazing. It was so full of flavour, you cannot believe such simple ingredients can produce such an amazingly delicious soup. My husband is a bit of a soup freak, loves soup. And I really impressed him with this one, I was quite proud of myself. Thank you Marco Pierre White. My kids loved it to, I am blessed to have children who love food as much as me. It really does let you try so many different things. I don't know what the secret is to getting kids to eat, wish I did, sorry. But I will say we only ever have one dinner on the table, not everyone loves every meal, but it is what it is and it is what will be eaten. It is a bonus when we all love it. This is the first time I cooked with dry cured streaky bacon. It is nothing like the smoked normal bacon we know. It has such a lovely subtle bacon flavour, really nice. Harris Farm in Bondi Junction has it if you live in Sydney but see if you can find it at your local deli. Also the original recipe says to use Knorr chicken stock pots, as I had never heard of them I was going to use a packet chicken stock I liked instead, but by chance I found Continental Chicken Stock Pots in my local supermarket and tried them, they are really good. As it was my first time using them, I didn't know what to expect, but they were really nice. Will definitely use again. I blitzed the carrot, onion and celery in a food processor to get it really fine, as I'm not a great chopper, and it is quicker. Do it by hand if you like but chop it into really small pieces. 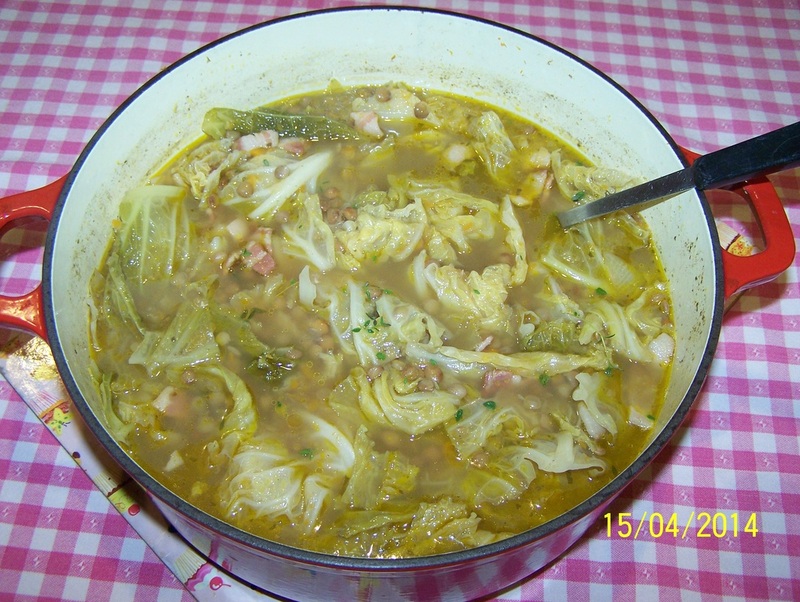 If once you add the cabbage and lentils the water does not cover the cabbage, add enough water to cover. if you used more than 500ml of water, add another chicken stock pot. Don't forget to soak the lentils at least 4 hours before making the soup. This is a quick hearty soup, packed full of flavour, give it a try, it is really nice. A perfect dish for winter. Pour the lentils in a large bowl, fill the bowl with cold tap water. Soak the lentils for at least 4 hours to rehydrate. Heat the olive oil in a large, heavy based saucepan. Add the carrot, onion and celery. Sweat the vegetables for around five minutes (Marco Pierre White says it removes the water content and intensifies the flavour). Add the bacon and cook, stirring, until the fat starts to run, you will see it as melts it glimmers up the base of the pan. Add the cabbage, separating the leaves as you are adding them, and 1/2 of the water (1 litre). Add the lentils and remaining 1 litre of water. Put on the lid, once it comes to the boil, cook for 5 minutes. Remove the lid and try and stir the cabbage around, push the lentils into the liquid also. The cabbage will collapse with the cooking. Add the Chicken Stock Pots, it may seem like a lot, but it isn't. No salt was needed for my liking, but I did add some pepper at this stage. Also I added the thyme in now. Bring to the boil, lid on, simmer for 20 minutes. Serve hot in bowls, with a drizzle of extra virgin olive oil, a small sprinkle if fresh thyme leaves and some crusty bread.